Americans Are Talking but Why Aren't Candidates Listening? Immigration became an increasingly polarized issue over the last few years. Now, loud voices on all sides shout each other down and crowd out any discussion of real solutions. Smears of “amnesty” have tarred numerous politicians, and the idea of dealing sensibly with the 11 million unauthorized immigrants in the United States appears to be anathema for many on the right. The recent Republican presidential debates only confirm how much immigration is a hot-button issue. Pro-immigrant and civil liberties groups are stepping up the pressure against US Immigration and Customs Enforcement’s (ICE) Secure Communities program. ​Undeterred by questions about hyper-aggressive tactics and possible over-funding, the Border Patrol has turned up the heat on the Olympic Peninsula, according to the Forks Human Rights Group. Now, if you give an illegal immigrant a ride in your car, you're at risk for being detained--even if you yourself are legal. 68 of the 265 Fortune 500 companies profiled paid no state corporate income tax in at least one of the last three years and 20 of them averaged a tax rate of zero or less during the 2008-2010 period. Among the 20 corporations paying zero or less in state corporate income taxes over the three year period are: Utility provider Pepco Holdings (DC); pharmaceutical giant Baxter International (IL); chemical maker DuPont (DE); fast food behemoth Yum Brands (KY); high tech manufacturer Intel (CA). “Corporate Tax Dodging in the Fifty States, 2008-2010” follows up on “Corporate Taxpayers and Corporate Tax Dodgers, 2008-2010” which was published in November by Citizens for Tax Justice (CTJ) and the Institute on Taxation and Economic Policy (ITEP). The two groups released their first major study on the federal income taxes that large, profitable American corporations pay on their U.S. pretax profits in 1984. The Homeland Security Department has published an expected draft solicitation for bids on a successor to a failed $1 billion virtual border fence. Immigrants are part of the 99% and on December 18th we will march with the Occupy Wall Street movement to demand immigrant justice including putting an end to wage theft, and stopping detentions and deportations of our beloved community members. As the Occupy Wall Street movement highlights corporate profiteering we would like to shed light on those that profit off our labor, exploit workers and refuse to pay dignified wages. We also march against the corporations who support racist anti-immigrant legislation that allows them to make billions of dollars by detaining immigrants in private detention centers and deporting nearly 400,000 people per year. This march is being organized by the Immigrant Worker Justice Working Group of the Occupy Wall Street Movement. We bring the voices and struggles of New York City s immigrant workers members of the 99% to Occupy Wall Street. 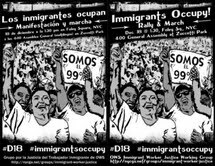 In solidarity with OWS and the immigration and labor movements, we lift up the particular organizing campaigns and concerns of immigrant workers. We believe that all labor should be honored and that all workers, regardless of immigration status, deserve equal rights and dignity. We recognize globalized capital in the form of financial institutions, multinational corporations, and neoliberal state economic policies as the impetus for economic migration to the United States, and deplore the fact that banks and corporations, supported by the government, continue to profit from immigrant detention and deportation. The leadership and participation of immigrant workers is necessary for any discussion of social, economic, and environmental justice. Los inmigrantes son parte del 99% y el 18 de Diciembre marcharemos junto al movimiento Occupy Wall Street para exigir justicia para el inmigrante. Mientras el movimiento de Occupy Wall Street destaca las excesivas ganancias corporativas, nosotros quisiéramos enfatizar sobre aquellos que se enriquecen por medio del trabajo de los inmigrantes, explotan a los trabajadores y rehúsan pagar salarios dignos. También marcharemos en contra de las corporaciones que apoyan la legislación anti-inmigrante generando billones de dólares recluyendo a inmigrantes en centros de detención privados y deportando a aproximadamente 400,000 personas al año. Queremos eliminar el robo de salarios y, frenar las detenciones y deportaciones de los apreciados miembros de nuestra comunidad. Mientras Occupy Wall Street se hace global, reconocemos el rol destructivo que éstas corporaciones juegan en la explotación de los recursos y la mano de obra en nuestros países de origen, lo cual obliga a millones a migrar. El 18 de diciembre es el Día Internacional del Migrante y nos hacemos solidarios con aquellos que a nivel mundial proclaman los Derechos del inmigrante y los Derechos Humanos. Esta marcha esta siendo organizada por el Immigrant Justice Working Group del movimiento Occupy Wall Street. Traemos las voces y las luchas de los trabajadores inmigrantes de la ciudad de Nueva York- miembros del 99%- a Occupy Wall Street. En solidaridad con OWS, los movimientos de inmigración y los movimientos obreros, elevamos esta campaña con las preocupaciones de los trabajadores inmigrantes. Creemos que toda mano de obra debe ser reconocida y que todos los trabajadores, independientemente de su estatus como inmigrantes, merecen igualdad de derechos y dignidad. Reconocemos el capital global-en la forma de instituciones financieras, corporaciones multinacionales, y el estado neoliberal de las políticas económicas- como el ímpetu de la migración económica a los Estados Unidos, y lamentamos el hecho de que los bancos y las corporaciones, apoyadas por el gobierno, sigan lucrándose por medio de detenciones y deportaciones. El liderazgo y la participación de los trabajadores inmigrantes es necesaria para cualquier discusión sobre la justica social, económica y ambiental. Following on the heels of a report by the U.S. Department of Justice condemning the MCSO [Maricopa County Sheriff's Office] for engaging in "discriminatory policing" and blasting its treatment of Latinos in and out of its jails, an incident involving a prisoner at [Sheriff Joe] Arpaio's Fourth Avenue Jail may end up offering more proof of the report's findings. Last Friday Joaquin Luna put on a white shirt and black tie—the same ones he wore every Sunday at the church he attended. The eighteen-year-old high school senior then kissed family members, went into the bathroom of his mother’s house in south Texas, and shot and killed himself. PARIS — Perceptions of the impact of migration in some countries are so distorted that their citizens estimate that there are as many as three times the number of immigrants living there than is actually the case, a global migration body says in a report being released on Tuesday. Tell ICE's Southern Office: Respect the Civil Rights of Immigrant Workers! Ever since SB1070 passed in Arizona, Southern states like Alabama have been quick to pass legislation that take the racial profiling bill to the next levels of hate. offices now are empowered to use their discretion with who is or is not deported. That means that ICE’s Southern Field Director in New Orleans, Scott Sutterfield has a decision to make. Last August, his office coordinated the violent ambush of thirty workers in New Orleans who had gathered to receive their paychecks. Now, the New Orleans Workers Center for Racial Justice and community leaders across the South are demanding Mr. Sutterfield attend a town hall meeting on the state of civil rights in the era of Alabama-style hate. Jobs with Justice has been working on this fight for a long time as a part of the Turning the Tides movement building, and we want to make sure that Sutterfield won’t stand in the way of their civil rights. 3. Ask five friends to do the same. If Arizona is the laboratory for these Right-Wing policies, the South has become their testing ground. While the administration talks about making immigration enforcement more precise, its own programs and the recent wave of state laws have been doing the opposite. Within those contradictions, ICE’s regional directors like Sutterfield become the deciding factor. (LAS CRUCES, N.M.) - The last four years have been a rough road for Mexican immigrants in the US. Anti-immigrant laws in Arizona, Alabama and other states have disrupted lives and sent people packing, while record deportations have uprooted longtime residents and divided families. If public policy shifts weren't enough, economic tremors have clobbered the Mexican immigrant community. That's according to a report by BBVA Research, an arm of the BBVA bank in Mexico.